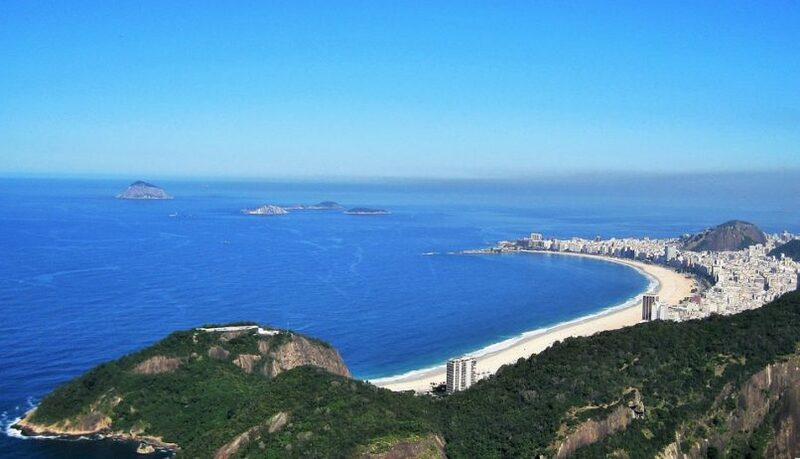 When you think of beaches in Brazil, nine times out ten you will probably think of Copacabana, Rio de Janeiro. The vast majority of people do not remember that Copacabana is in fact a district and rates as the 11th highest developed district in Rio. It yields a wealth of history and culture as well as a world famous beach and a lifestyle renowned worldwide for its vibrance. The long famous beach is everything and more than you’ve seen on the TV and read in magazines. The area is bustling, full of cafes and surrounded by walking roads and beach sport facilities. The mood there is very festive and the beach is beautiful! Whether you enjoy to spend your time actively or enjoy a more relaxed time on the beach, you can decide to join the locals on an afternoon run or sip a drink at one of the seaside bars and enjoy a gold cup of chopp (draft beer) and refeicao (herbed meat and fried onions). Looking left of Copacabana beach, you will see the giant Sugar Loaf mountain and also Fort Duque de Caxias which was built in 1779. Look right and you will glimpse Copacabana Fort, dating back to 1914. If you are a fan of drifting along and people watching, the Copacabana promendade is a 4km pavement landscape that runs the length of Copacabana. Rebuilt in 1970, the Copacabana promenade utilises a black and white geometric wave pattern. This is a traditional Portuguese design used from the 1930’s and was designed by Roberto Burle Marx, a Brazilian landscape architect… as well as a painter, print maker, ecologist, naturalist, artist and musician. In short, history, activity, sunshine, positive energy and colour all sum up the quintessential Rio beach experience in a city bustling with culture. Get your sunglasses, prepare your free and easy beach clothing and take a step into the ultimate example of the high life. Top tip: Try ordering “peixe frito na brasa”, which is a fried fish plate or sample some “aipim com carne seca”, a dried meat with a fried manioc root. Enjoy!